This series depicts the area near En Gedi, the mountains around the Dead Sea. Mountains are used metaphorically in the Bible. Abstractly she has tried to depict the unique significance of this land by exaggerating the balding mountainous compositions with compacted space and dramatic color in illuminate contrast of light. Edges and boundaries and dividing lines with special twists are what is important. Hidden are elements of the human form which vaguely help to organize these richly created fields of color and depth." 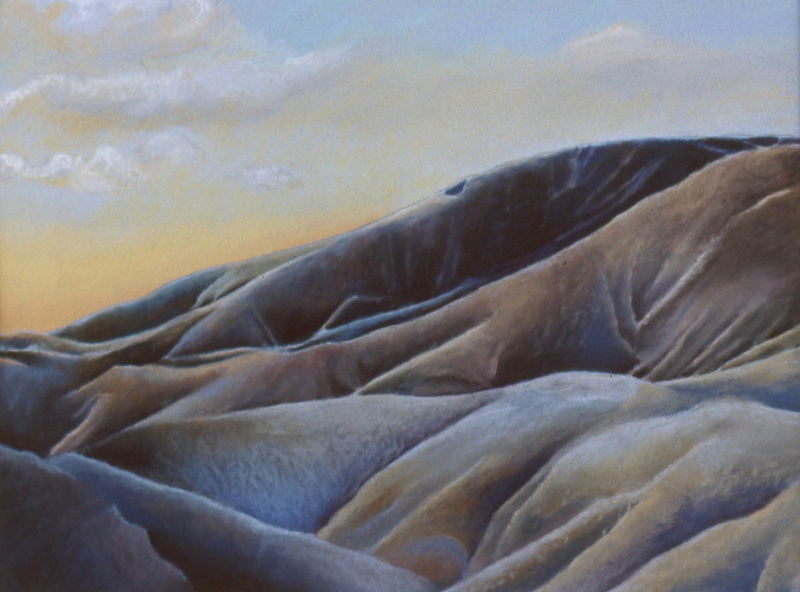 Devi Anne Moore's pastels of Israel reveals that country to be a silent land of desert vistas , mountains and rolling ground formations that have remained unchanged for centuries. Giclee Prints can be refunded up to 95% of the amount that you have paid as long as your order has not been processed for printing. Processing for print typically takes one week. Once your order has been processed for print no refund will be given.